“I am a product of the Orleans Parish school system, a graduate of Walter L. Cohen senior high school, Southern University at New Orleans, (SUNO) and Southern University and A & M College in Baton Rouge, LA. I earned an Associate of Arts in Computer Science, a Bachelor of Arts in Print Journalism and a Master of Arts in Social Science with a concentration in African-American History. During my time at SUNO, I worked as the assistant editor for the school newspaper. I have also written various articles and op ed pieces for a variety of newspapers and online columns, i.e., the Times Picayune newspaper, USA News Today, the Dallas Weekly newspaper, the Sun Times, Bayview newspaper in California and The New Orleans Tribune where I also worked (on and off for over 20 plus years) as the editorial assistant, copy editor, writer and sales representative. I have interviewed everyone from a former mayor of my city to a former governor of my state. 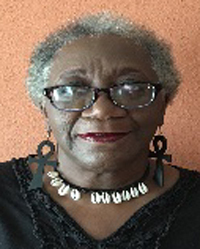 “I have volunteered in the Orleans Parish school system with all my six children, who are now grown, as well as with my oldest granddaughter and, on occasion, the younger grandkids. I have an affinity for the teens of my community because I feel that they are the most neglected and forgotten. For this cause, I tend to gravitate towards volunteering with those groups of people. However, I have also worked with younger children in various volunteering ways. I am a member of the Orleans Parish Education Network/Parent Leadership Training Institute, (OPEN/PLTI), an Evacuteer with the City of New Orleans, a graduate of the Foundation for Louisiana’s LEAD program, (Leadership, Engagement, Advocacy, Development) a seven-week leadership skills-training workshop which deals with issues that affects my community. I was also a founding member of the now defunct parent group C.U.R.E. (Citizens United to Reform Education), the title name in which I came up. “Since returning to my city in June of 2011, I have sought to make a difference in how the new changes impact our lives, post Hurricane Katrina. However, my major focus has been on volunteering with children, students and those whose voices need to be heard. In the past, I also volunteered as a CASA worker (Court Appointed Special Advocate).